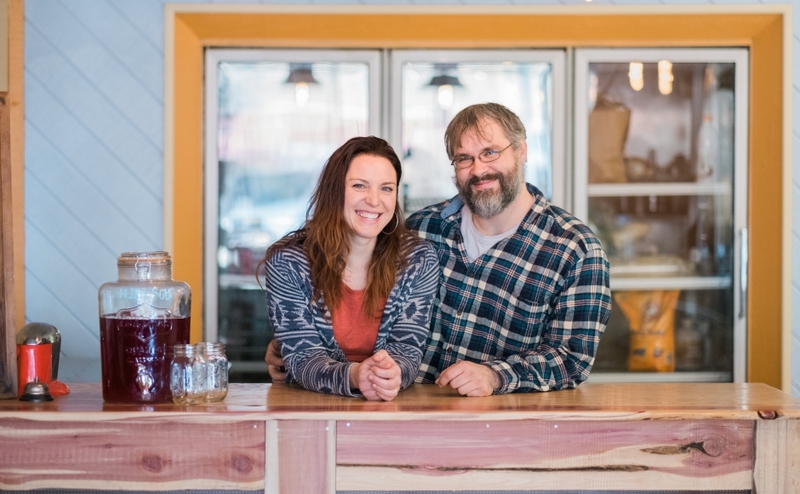 Jackie and Dan Walther are excited to bring The Square Meal to Oaklyn. Credit: Tricia Burrough. 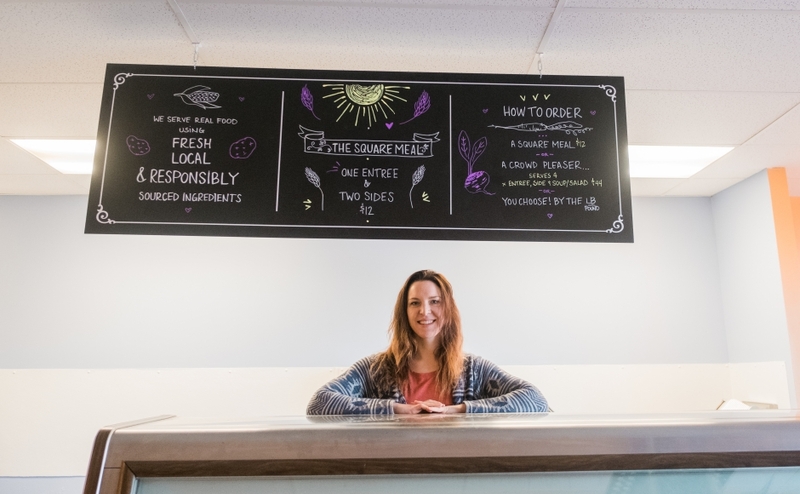 Audubon residents Dan and Jackie Walther bring their New American deli to West Clinton Avenue with organic, locally sourced, sustainable foods prepared for a variety of diets. Dan and Jackie Walther have flipped the interior of the former Viola’s Deli to refresh its look. Credit: Tricia Burrough. When Dan and Jackie Walther first opened The Square Meal at the Crystal Lake Pool snack stand in Haddon Township, the Audubon couple thought of it as the more realizable version of a dream deferred. 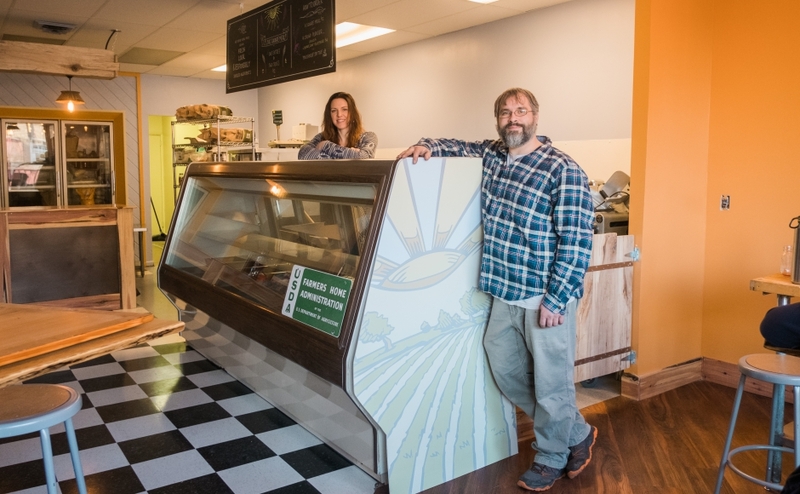 In their heads, the ideal expression of their sustainable eatery always would have been a corner luncheonette, but Dan, an electrician, and Jackie, a teacher in the Pennsauken school district, had yet to dip a toe in the food business. They did know how to cook, however, and within a summer, the momentum they’d generated by replacing the typical poolside fare with organic nacho platters, fresh fruit smoothies, and hormone-and-antibiotic-free grilled sandwiches springboarded their seasonal business into a permanent home in The Factory in Collingswood. After Viola’s Deli shuttered its location on West Clinton Avenue in Oaklyn, the Walthers saw the opportunity to expand into a Main Street storefront. This Friday, when The Square Meal opens its doors to the public, the Walthers finally will have their luncheonette. The wood countertops at The Square Meal are sustainably sourced, as is the fare. Credit: Tricia Burrough. Inside, the couple dramatically overhauled the space, adding seating for a dozen customers at high-top, live-edge wood community tables. Most of the major appliances and all the existing countertops were replaced. The vinyl composition tile flooring was patched up, buffed, and resealed, and offset from the seating area with vinyl plank flooring. 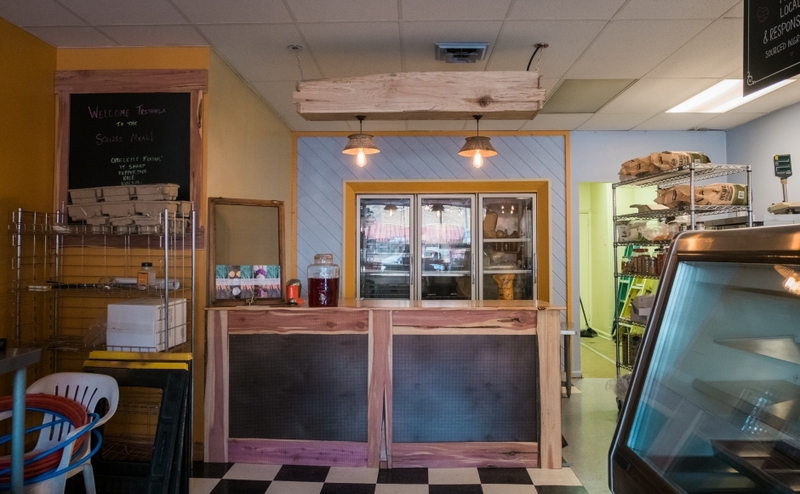 The tables are crafted from sustainably harvested red oak slab by the urban forestry service Full Circle Woodworx, and cedar planks from Connerwood Farms in Woodstown provide colorful accents at the counter. The interior colors were updated from a charcoal gray to the sky blue, sunny yellow, and earthy orange of the Square Meal palette. Capturing the artistry of that historic period is only one aspect of the Walthers’ outlook on the food business. Dan Walther said the couple is fascinated by the pace of life at the dawning of the industrial age: a transitional period in American history where industrialization hadn’t yet overtaken smaller, independent food producers. Jackie Walther stands at the lunch counter of The Square Meal. Credit: Tricia Burrough. “That’s really why we chose that time period as a style point,” he said. “You were eating regionally; you were eating seasonally; you were eating what’s around. “It was easier to have things all the time, but you were still having a realistic diet,” he said. Dan Walther describes The Square Meal culinary aesthetic as “New American Deli,” which translates as humanely and responsibly sourced organic meats and produce native to the tri-state area. Home-style recipes center on slow-cooked meats, fresh roasted vegetables, fermented foods, and scratch-daily soups. There’s something for everyone on the menu, which caters to omnivore, vegan, gluten-free, paleo, and ketogenic diets. Jackie Walther said the couple prepares Ayurvedic-inspired dishes. Dishes are made to order, or customers can select from among prepared meals, which include an entrée and two sides for $12; family portions feature four entrees, a large side, and soup or salad. The Square Meal serves lunch and dinner, but breakfast sandwiches are available all day. On weekends, the eatery will feature a breakfast buffet and made-to-order omelet station. 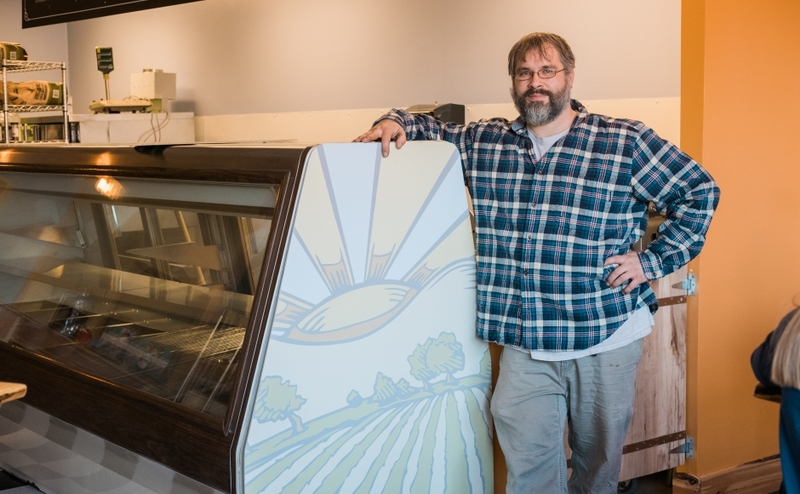 Dan Walther stands at his deli case, created by Walter’s Signs. Credit: Tricia Burrough. Jackie Walther said customers can expect potatoes and toast, roasted veggies, baked apples, rolled oats, gluten-free corn bread, and vegan scrambles. Beverages include Revolution Coffee Roasters Ethiopian Sidamo, teas from ayurvedic therapist Janet Watkins of Audubon’s Live in Joy Yoga, and house-prepared, herbal-infused waters based on her recipes. The business also provides weekly, customizable, diet-specific meal plans, and is partnering with trainers and fitness centers to make these options more broadly available throughout the area. Jackie Walther said the new Upcycle-Yogawood business in Collingswood will feature their meals in a take-away case. “We want people to know that they’re welcome to come in and hang out, take home some dinner for their family, or stock up on healthy meals for the week,” she said. The Square Meal is located at 211 W. Clinton Avenue in Oaklyn. Credit: Tricia Burrough. Jackie Walther describes the couple as “business hippies,” who place a premium on health, fitness, and sustainable culture. They teach at Trishula Yoga in Collingswood and spend their free time reconnecting with nature by backpacking, hiking, canoeing, and cycling. Jackie Walther grew up in central Florida before moving to Berlin as a child; Dan Walther was raised in Winslow. Both were raised on farmstand produce, and still cite that upbringing as anchoring their palates. “Once stuff was in season, it was on the side of the road,” Dan Walther said. “The idea grew that there needs to be more food places that cook like this, using clean, whole foods to make meals, and knowing where your food is coming from,” Jackie Walther said. 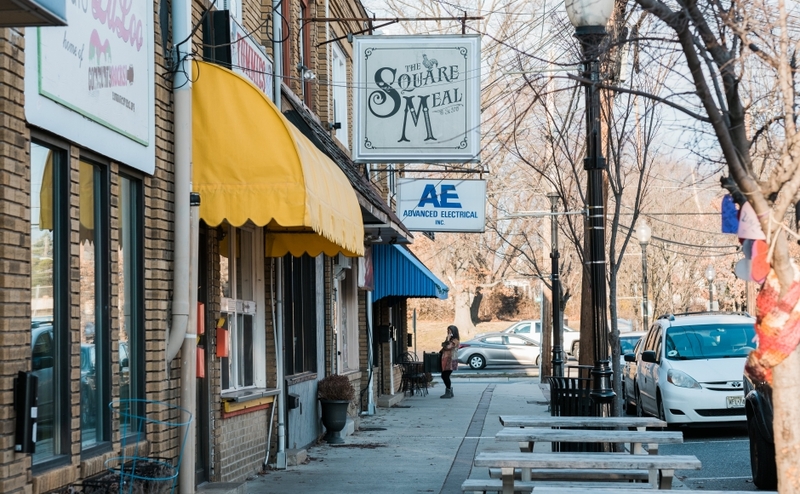 The Square Meal will be open from 11 a.m. to 9 p.m. Tuesday through Thursday, until 10 p.m. Friday and Saturday, and from 10 a.m. to 4 p.m. Sunday. Those hours are designed to coincide with the stream of traffic the nearby Tonewood Brewing has generated in the Oaklyn central business district. 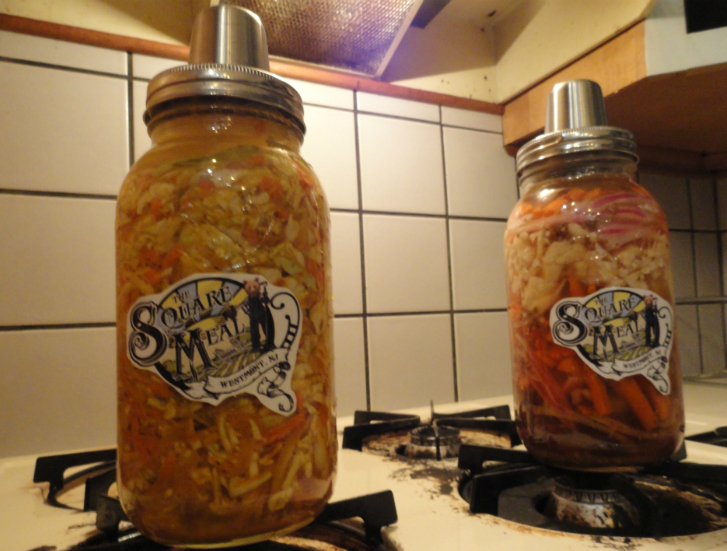 Square Meal sauerkraut. Credit: Matt Skoufalos. “We’re hoping to serve their customers a lot and keep the energy that they’re building flowing in that town,” Dan Walther said. “We want to make it convenient for people to get a nice full meal,” Jackie Walther said. The Square Meal is located at 211 West Clinton Avenue in Oaklyn. For more info, call 609-254-1736, or visit the business Facebook page.